I made this for breakfast on opening day of the NFL and have been dreaming about it ever since. 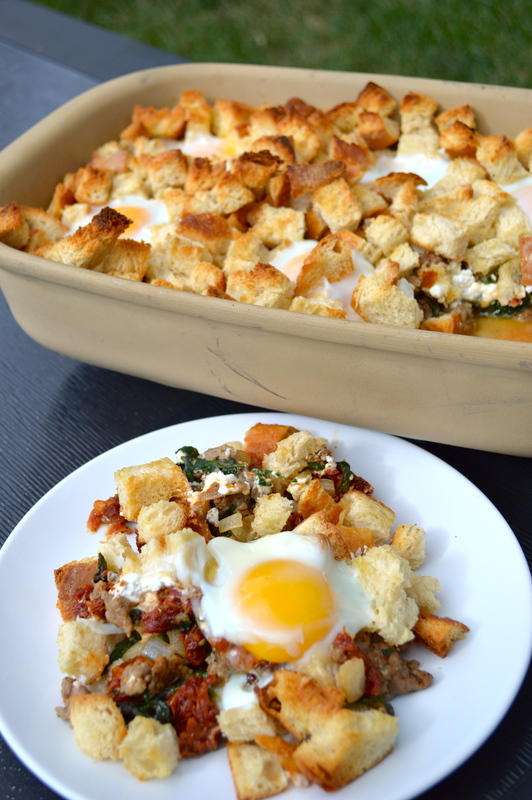 It is really easy to throw together (and can be almost fully prepared a couple hours ahead of time) and is perfect for a weekend breakfast or brunch. I think what I liked most about it is that it reminded me of a dish my Gramma Jean makes every Christmas morning! This one is italian sausage sautéed with spinach, onion and sun dried tomato that gets layered in a casserole dish with goat cheese and toasted chunks of crusty italian bread. Six eggs then get dropped into little pockets in the bread and then the whole thing gets baked in the oven until the the bread is golden brown and the eggs are over easy. The sweetness of the sun dried tomato plays really well off the spiciness from the sausage and the creaminess of the egg coats the buttery bread giving the whole thing and incredibly satisfying taste! Preheat your oven to 400 degrees. Cut up 1/2 loaf crusty italian bread into bite sized cubes (our store makes a great Garlic Tuscan bread and that extra seasoning made this even better!) and toss with 1 tbsp extra virgin olive oil and spread evenly in a single layer on a rimmed baking sheet. Bake until they begin to turn light golden around the edges, 10 to 12 minutes (they will continue to brown once the whole casserole goes in the oven so don’t over brown them here!). Remove from the oven and set aside. Meanwhile, Heat another tbsp extra virgin olive oil in a large skillet over medium-high heat. Add 1 medium white onion thats been chopped and 1 lb italian sausage that’s been removed from its casing. You can use sweet, mild or hot here… I used Mineo and Sapio’s hot italian sausages because they’re my favorite. Break up the sausage with a wooden spoon and cook until the sausage has cooked through and the onion is soft, 8 to 10 minutes. 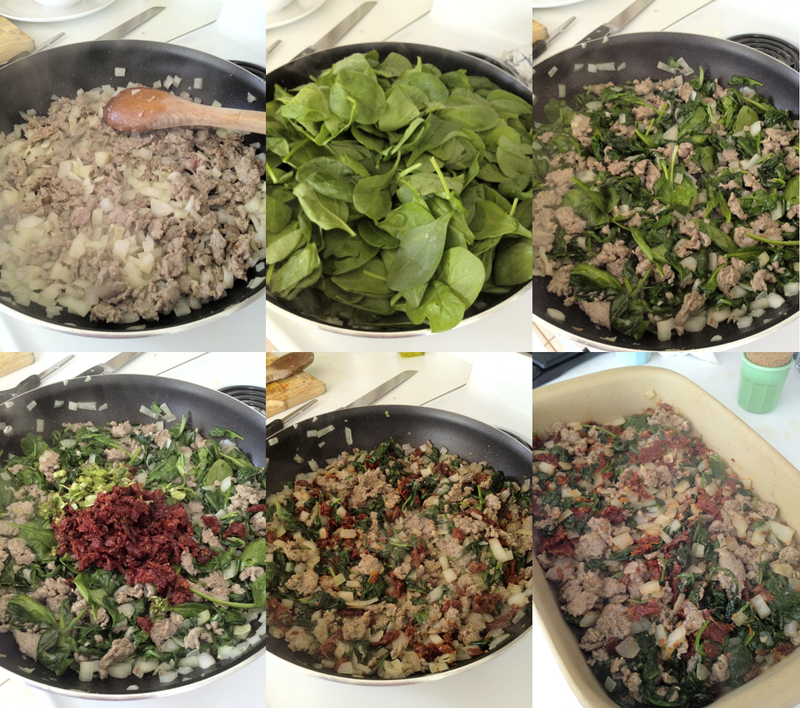 Add the 10-12 oz fresh spinach leaves and cook, stirring frequently, until wilted, about 2 minutes. Add 6.5 oz sun-dried tomatoes that have been packed in oil (drain and chop them before adding) and 2 tbsp fresh chopped basil. Season with salt and pepper and spread this evenly onto the bottom of a 13″ x 9″ casserole dish. Sprinkle 5 oz goat cheese on the mixture and arrange the bread cubes on top. Make 6 slight indentations in the mixture leaving room in between each one, this is where the eggs will go. If you’re not going to serve this right away then you can cover the casserole and keep it in the refrigerator for up to two hours. When ready to finish baking, crack 1 egg into each indentation (6 large eggs total), making sure to keep the yolks intact. Sprinkle the eggs lightly with salt and freshly ground black pepper. Bake until the egg whites are set but yolks are still runny, about 15 minutes. If you want your yolk fully cooked just bake for 18 minutes! This looks great! I love a dish that is simple to put together, delicious and can feed a bunch of people! Yes I love that too! It’s a great go-to recipe for a group of people! Love this recipe! I made a version of this last Saturday and put it in ramekins for single servings. Your recipe looks wonderful and I will have to try it. Love the idea of doing it in ramekins! I think I’ll have to play around with it to come up with a recipe to just make a couple servings of it like that! YUMl!! Wish I had everything to make this tomorrow, because I am definitely craving it now!